Here’s the view from the back of Carlton Auditorium during a panel presentation about how to deal with challenging student situations. There’s lots to consider when you’re a new teaching assistant. That was the take-away for the more than 350 teaching assistants who attended the day-long orientation for new teaching assistants at the University of Florida. That was a take-away for me, too, as a presenter — as I planned what to share with the new TAs in my talk and also as I listened to the questions the TAs asked during my session and the other orientation sessions I attended. I talked about developing a checklist of what needs to be accomplished before school starts next week, from meeting with their teaching supervisor to reviewing their online persona/avatar to the classroom where they will be teaching and try out the technology. I also explained what I’ve coined as the COPE Strategies that can help teachers develop a more student-oriented approach to their teaching. 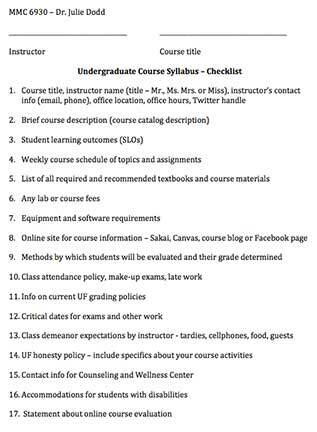 We spent much of our last class meeting discussing the many decisions involved in creating an undergraduate course syllabus. We talked about how Bloom’s Taxonomy (1956), updated by by Anderson and Krathwohl (2001), can help with one of the most important first steps in developing a course — determining the student learning outcomes (SLOs) for the course.